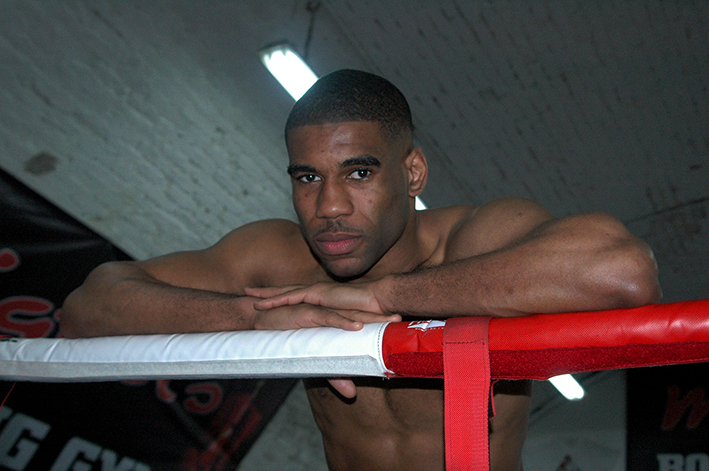 One of the UK’s most exciting and entertaining young boxers of today, Lewisham Light Heavyweight Jovan ‘Young Star’ Young may have a five fight unbeaten record, but incredibly to date none of his home fans have yet to see the former Repton Amateur star in action as a pro. 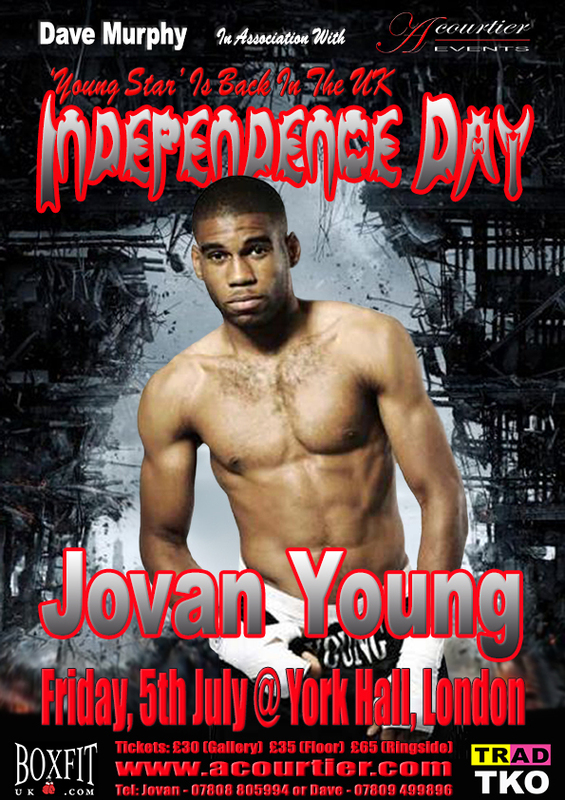 But now that’s all about to change, as Jovan makes his British debut on the Dave Murphy, in association with Acourtier Events, promoted ‘Independence Day’ extravaganza at York Hall in Bethnal Green, London on Friday, 5th July 2013, against Florida, USA’s Manny Muhammad. 25 year old Jovan turned professional in June last year and travelled to Punta del Este in Uruguay for his professional debut, against Sao Paulo Brazil’s Gilson Silva. An early finish was the order of the day with Jovan stopping Silva in the third round. Two months later Jovan once again packed his bags, this time crossing the big pond to face homeboy Ivan Burke in Charlotte, North Carolina. Once more Jovan finished early,this time stopping his opponent in the second round. Three weeks later Jovan was once again in action in North Carolina, this time in Winston-Salem, where he took on local Cruiserweight Willie Bookman. As with his previous outings Jovan stopped his opponent early, just this time though it took Jovan just two minutes and thirty four seconds of the first round to dispatch Bookman. Two weeks later Jovan made the relatively short trip, to Columbia, South Carolina, where he faced, and beat Marlin Washington on points. Three weeks later Jovan was back in action in North Carolina, this time in Greensboro, where he faced Atlanta Georgia’s Yuwshua Zadok in a six round contest. After six grueling all action rounds against Zadok, the judges were split, Judge Marty Garner see it 58-56 in favour of Jovan, Judge Tyrone Evans see it as a 57-57 draw and Judge Time Gosch also see it as 58-56, but in favour of Zadok. Following a training session at Miguel’s Gym in Brixton, Jovan took a little time to talk about his upcoming ‘home’ debut. “I’m excited, really, really excited. I’ve been away for too long, I’ve been fighting away in America, even went to Latin America for my debut fight. I’m really excited to be finally making my home debut. There’s nothing as special as fighting in front of your home crowd, I know that from my amateur days, so am really looking forward to fighting at York Hall on July 5th. It’s ironic that the guy I’ll be fighting on July 5th is American, but that’s what I have been doing for the past year – beating up Americans. As I said I am really looking forward to fighting at York Hall, I mean it’s the home of British boxing, if you’re an English fighter you want to fight there, it has the most amazing atmosphere. Jovan ‘Young Star’ Young versus Manny Muhammad features on the undercard of the Jennifer Rezke - Mikaela Laurén, Light Middleweight World Championship fight, that headlines the Dave Murphy, in association with Acourtier Events, promoted ‘Independence Day’ event, which takes placeat York Hall in Bethnal Green, London, on Friday 5th July 2013.